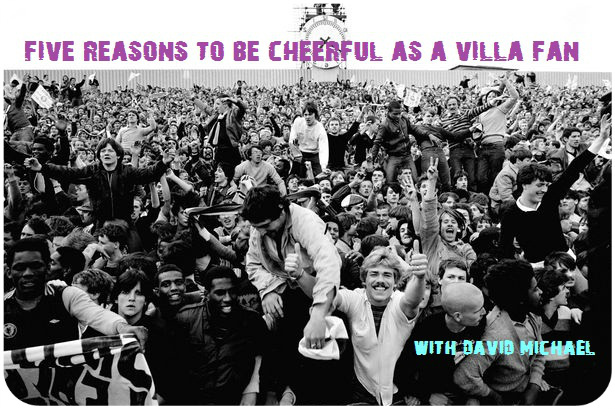 Five Reasons to be Cheerful as Villa fans after Swansea Stalemate. Home Columns Five Reasons Five Reasons to be Cheerful as Villa fans after Swansea Stalemate. Lambert’s realisation, tough master plan and the return of the AWOL duo? 1. Well, the four-game losing streak has been broken. If Villa had lost again, then the knives would have really been out and a toxic atmosphere would have been created. Still one point from 15, isn’t exactly cheery stuff. 2. “The game is about putting the ball into the net” – Lambert after the game. Excellent, he’s finally worked it out. Villa can surely kick-on big time from now on! With this realisation, a top-half finish is pretty much guaranteed now. 3. ‘We are only 18 months into our project, I knew the first few years would be tough.’ – Paul Lambert after the game. Well, that’s ok then, isn’t it? But surely, if you knew it was going to be tough, why didn’t you act accordingly? You know, sort out a decent midfield etc. Just a thought. 4. Christian Benteke and Ron Vlaar are closer to their returns. Although the silence of a proper time frame for their return is worrying. If they come back for the Sunderland game, that’ll surely give the team and fans a real lift going into the new year. Lets at least get some kind of 2014 unbeaten run going. 5. The Villa fans were behind the team during the game. Of course, you have a right to boo at the end of the game, since you’ve paid hard-earned cash to watch players paid fortunes serve up dross. One only has to look @ ManC to see how much they have spent to see that buying a team that will win every time is not just a case of splashing the cash ! And Lambert is building a squad not just for now but also for the future, on a limited budget , so of course it is hard. To many fans, winning in Europe is not even a memory , & the cup wins of the 50’s did they really happen ? Of course they happened , but the club failed to build on such success and became a slumbering giant . Yes Villa is a big club as few clubs have a training ground like Bodymoor let alone the new facilities built since Randy took over from Doug ! But were all those 6th place finishes good enough under O’Neil ? Certainly the over spending with little else to show for it was not . Many say more needs to be invested in the club , but is that true , & where should that money come from ? Some say Randy should donate it as he’s rich , but compared to ManC’s owner he’s poor & that is part of the problem , or is it ? ManU’s owners are not that wealthy yet they have a very nice living from the profits @ their club .. But surely footie is a loss making Industry ? Yes it is , but there are many ways that money can be generated from off field activities , and it is from such things that ManU generates it’s income . So why can’t Villa do the same ? Think that since Randy has taken over, the club has started to do so , but there has not been sufficient success on the pitch to generate sufficient investment & that is largely down to there being little to show for all those 6th place finishes & the not so spectacular exits from Europe ! So what of the future ? A lot of players have left & have been replaced ??? with more than an eye on the future . the skeleton of a squad has been built , but it still needs fleshing out if it is to compete @ the highest level .